The Ameristar Casino Hotel East Chicago. A full-service luxury hotel, with its 15 story tower, boasts a variety of amenities including deep soaking tubs, glass enclosed showers and more. Each of the 288 newly renovated guest rooms features your choice of a single king-sized or two queen-sized beds. The hotel connects directly with both the casino and pavilion – a convenience that adds to the experience. A 24 hour Fitness Center is available for your use throughout your stay. Fun can’t be measured in square footage, of course, but if it could,this 56,000-square-foot casino at Ameristar Casino Hotel East Chicago, with its four spacious playing levels, would come out on top. 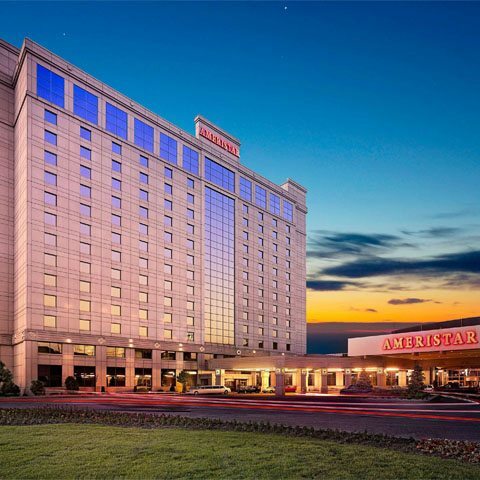 Open all day, every day, Ameristar Casino Hotel East Chicago has one of the largest selections of games in northwest Indiana, with more than 1,700 of the latest and most popular slots and video poker games and 65 table games. If you can’t find your favorite game here, it just may not exist!